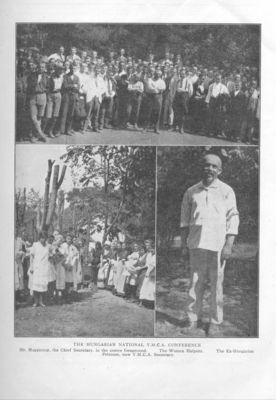 This montage shows various scenes from the Hungarian National YMCA Conference held in 1921. After the war, the Association expanded its efforts to develop the Hungarian YMCA. Magercsy, the Secretary General of the National Hungarian YMCA Committee, stands in the middle foreground of the top photograph amid the other delegates. Women supporters pose in the photo to the lower left, while a former prisoner of war and new Red Triangle secretary is featured in the lower right photograph.